Some people are lucky enough to have a natural talent for drumming. These people may have to struggle a little bit in the beginning with separating their limbs, but once that hurdle is overcome, the skills develop in leaps and bounds. Sigh… I wish I was one of those people…. However, developing the skills to play drums is one thing. Tuning them on the other hand is a whole other art-form. Tuning can be done in a variety of ways, the most common, is the old-school method of tapping the head, listening and adjusting, rinse, repeat. If you’ve developed your tuning skills with this method and you have a good ear, this might be the fastest method. Not everyone has that ear for perfect pitch though. Some of us choose drums, because we love playing music, have rhythm, but lack an ear for pitch. There are also “note-sniffing” tuners. These work just like a guitar tuner, by measuring the most dominant frequency. Drums have a whole spectrum of frequencies though. Isolating the dominant one is a bit more challenging than for other instruments. 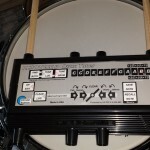 For this reason “note-sniffing” tuners for drums are optimized for the specific task. Other tools for tuning drums include lug torquing devices, focusing more on the tension of the bolt than the sound of the head and “Timpanic pressure” gauges, that, as the name implies gauges the tension of the head itself. Then there’s the subject of this article, the Resotune II, an advanced device. 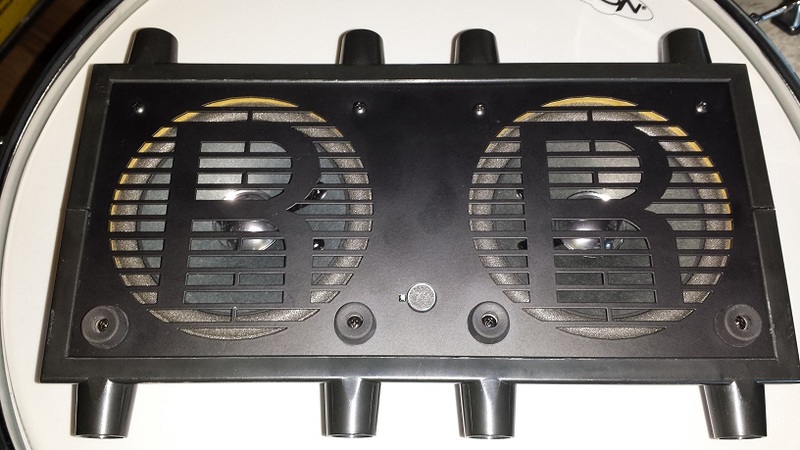 By far the most advanced tuning device I’ve come across. This device deserves some serious close-up examination. Thus we serve up this Extensive Review of Resotune II. 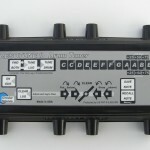 “Note-sniffing” tuners rely on the frequency produced by tapping the drum’s head. This adds a variable to an already complex equation. For consistent results, one would have to tap with equal force, in the exact same position, repeatedly. This on top of attempting to isolate the dominant pitch from the multiple additional frequencies. If you’ve tried one out. You’ll know what I mean. The dial skips around from one frequency to another. Circular Science, the company behind Resotune II, takes an entirely different approach. Two on-board speakers pointing at the drum’s head, produce tones that cause the head to vibrate. The head’s vibration in turn produces it’s own tone that is picked up by the devices microphone. An internal processor then analyzes the returned frequency, comparing it with the tones fed to the head by the speakers. By means of complex software algorithms, the device can then accurately determine the head’s tuning. For a simplified illustration, sing into a drum. Alter the note sung and listen to the tone the drum returns. Multiple different frequencies are output by the speakers and each returning tone from the head is fed into the algorithm for analysis. While this approach is more complex, it results in perfect consistency, pin-point accuracy. and repeatable outcomes. Before I can accurately describe the capabilities of Resotune II a few basic concepts of drum tuning must be covered. A drums overall sound and pitch is affected by multiple tunings. The relationship between the frequencies produced by the top and bottom head results in a drum’s fundamental pitch. If that sounds simple enough, we’re about to complicate it. Remember the cat? Producing a fundamental pitch of a perfect “A” can be done in literally thousands of ways. As an example, start with tuning both heads to the same “A”. This will result in a fundamental pitch of the note “A” with maximum sustain. (In theory). 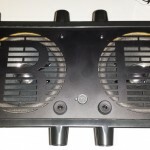 Now adjust the top head up by a quarter turn of the lugs, then adjust the bottom head until we again reach a fundamental pitch of a perfect “A”. Get the picture? All these methods of producing the same note, will produce different sounds. Sustain can be increased or decreased by the relationship between the heads, as can overtones. (All those other frequencies aside from the fundamental pitch.) Decay, the sound emitting from the drum during the sustain also varies with the multiple ways of producing the same fundamental pitch. As if that isn’t complicated enough, there is a third element to tuning, the shell itself. If you remove both heads and tap the shell, it makes a sound. That sound has a pitch. In theory, the cleanest, clearest and most sustaining tone is produced by tuning both heads to the same pitch as the shell’s. With the “primer” out of the way we can move on to the capabilities of Resotune II. The device has a few different “modes”. A suitable starting point is the “Find Both” mode. This function provides a reading of the drum’s fundamental pitch as well as the note of the drum head currently being analysed. The next mode is the “Tune Lug” mode. This mode gives a reading of the current drumhead’s pitch while tuning the lugs to the desired note. 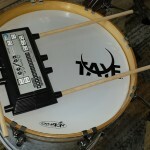 In contrast, the “Tune Drum” mode provides a real time reading of the whole drum’s fundamental pitch while adjusting the lugs to the desired note. Finally we have the “Clear Lug” mode, used to accurately match each lug to the exact same pitch in order to produce the clearest and cleanest note for each head. It’s time to take the device for a spin. Resotune II comes with the device itself, a selection of dowels for supporting the device on various size drums and four clamps to combine dowels in order to reach across large drum heads. Also enclosed is a contraption of dowels used to set the device close enough to the head on the bass drum. 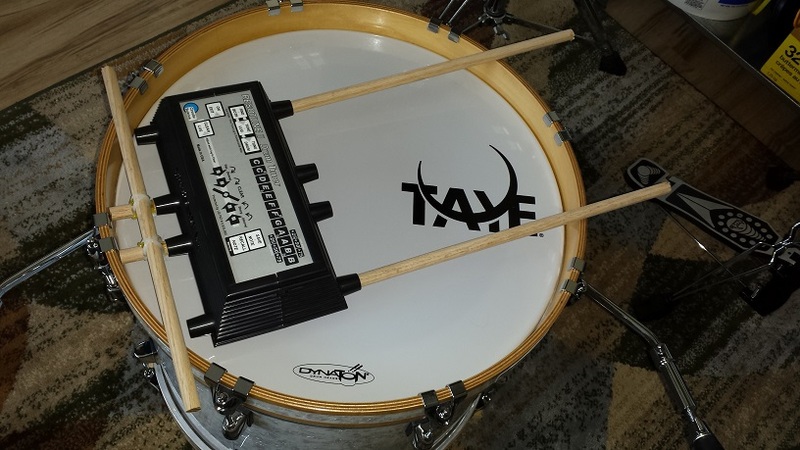 Our initial tests are performed on the Taye StudioMaple BeBop kit reviewed here. For starters we’re simply going to use the Resotune II to optimize the current tuning for maximum sustain. First up is the 12″ tom. For convenience I raise the tom holder enough that the tom can be flipped upside down. Place the device with the two dowels on top of the batter head. Powering up the device results in a short “boot-up” sequence which displays the software revision and serial number of the device. Press “Find Both” and the device emits a series of tones while displaying notes in red and green. The red notes represent the drum’s fundamental pitch and the green the subject head’s tuning. After a short while the device settles and displays the two tones. Now press “Tune Lug” and allow the device to guide the tuning of the top head to the fundamental note displayed earlier. Next switch to the “Clear Lug” mode and the device will guide you through the separate tuning of each lug. Simply move the device from lug to lug while adjusting as per the devices guidance. Easy Peasy! As with any other tuning method, you may have to adjust each lug more than once before they all report back as “cleared” (Green) As a side-note, as you get closer to clear, you start to hear the head resonate more and more in harmony with the tone emitted from the Resotune II. Next we flip the tom over and use the same method to tune the bottom head to the identical pitch as the batter side. Indeed the result is cleaner, crisper and noticeably longer sustain than before. After a few subsequent experiments with the fundamental pitch, following the same routine, we settle on a pitch that seems to be more or less optimal for this particular tom. Probably at the pitch or in harmony with the pitch of the shell. The result is a tone that sustains like a Zil-Bel. As much a testament to Taye’s excellent drums as to the Resotune II’s ability to wring the most out of them. The note is just hanging there in mid air, exactly in the same way a rug doesn’t, unless it’s a magic carpet. Speaking of magic, at this point I’m almost inclined to believe there’s some sort of voodoo going on with the Resotune II. Now quite excited I rapidly tune the rest of the kit following the same procedure, except the snare. I’m too much in a rush to try out the results to be bothered with removing the snare wires and I really like the snare’s tuning as is. Tuning of the bass drum requires the use of the aforementioned contraption to get the device closer to the head than if it was resting on top of the hoops. As much as I was eager to test the results, I did take my time to find a fundamental pitch that suited each drum while still maintaining a pleasant relationship between them. This did take a while, but it was an enjoyable time. Using the Resotune II greatly illuminates the information shared in the capabilities section above. The device in a way serves as an educational tool to facilitate the understanding of the various complex properties that together make up the sound of a drum. Once completed the floor tom and bass drum now exhibited the same incomprehensible sustain and tone that was wrung out from the tom tom. Maybe not a practical tuning for most genres of music but an insanely cool exercise to go through. We proceeded with testing various tunings on a selection of drums. While not all drums sound as good as Taye’s StudioMaple, The Resotune II will help you get any drum to sound the best it can. While the device doesn’t have built in capabilities to achieve particular voicings, it can certainly guide you once a voicing is established. Just for fun we used Google to find voicings for a handful of famous drummers and used the Resotune II to guide us in copying these voicings. 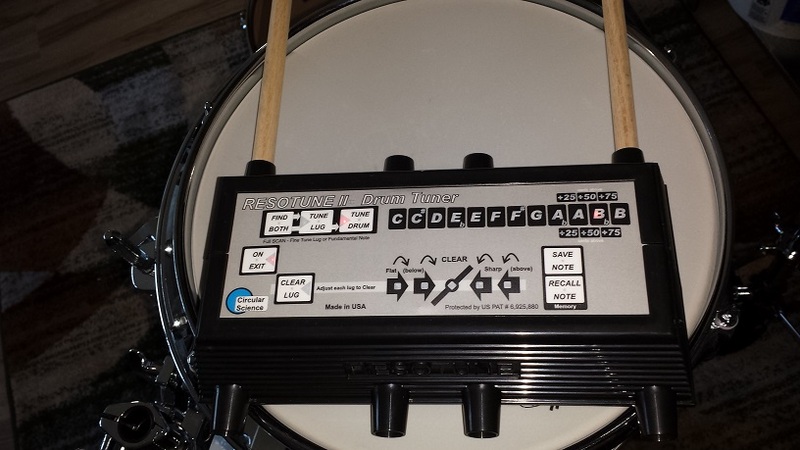 As long as tunings with specified bottom and top head pitch is found copying them onto your own drum kit is a breeze. “RESOTUNE precisely vibrates the drum heads with tones made by it’s internal speakers then measures the actual drum vibrations coming back. Besides identifying the two significant lowest pitch head resonances from how loud the returning sounds are RESOTUNE also measures the signal return time delay to identify individual lug tension’s impact on the standing wave in the drumhead. Adjusting each lug for identical return time signature precisely matches them to each other for optimal tonal purity when played. We call this measurement “clear quality” and even show which direction a given lug needs to be adjusted for optimal clear. This clear measurement is different than adjusting the note pitch, and performed after you have already tuned your drum to a desired note pitch. 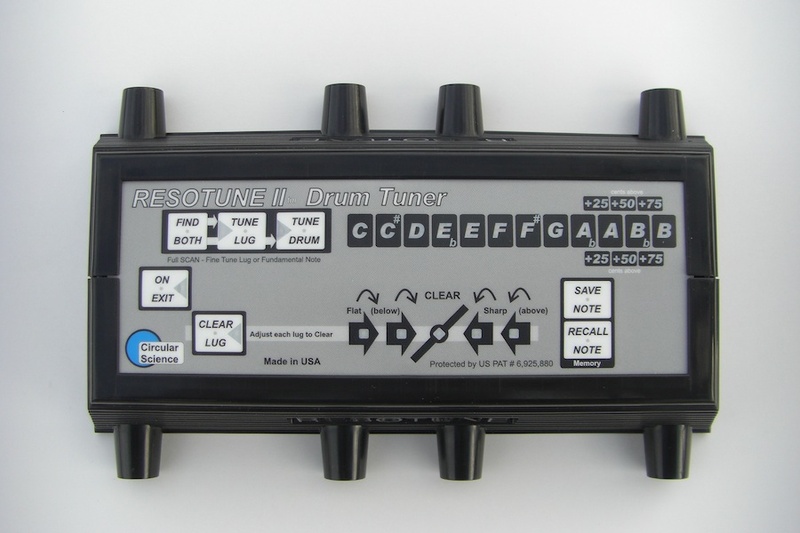 Resotune II is highly accurate drum tuner using a patented technology. Don't miss our extensive review of Resotune II. We examine and test every aspect.